A thirsty crow looking for water saw a pitcher in the distance, and flew joyfully towards it. The pitcher certainly had water in it, but it was so near the bottom that no matter how he strained and struggled he could not reach it. Then he tried to overturn the pitcher so that he could at least have a little of the water when it spilt to the ground: but he was not strong enough to do this. Just then he saw some pebbles lying near, so he picked them up one at a time, and dropped them into the pitcher. As the pebbles filled the pitcher, the water gradually rose until it was level with the top, and the crow was able to drink at last. It is this kind of inventive intelligence, far sightedness and willingness to be creative that is the hallmark of Raven medicine. This is where Raven gathers the deep magic he brings to the earth. Raven represents the Great Mystery of the Void. Black, to Native Americans, is a color of magical power, and only to be feared if misused. Raven symbolizes the void - the mystery of that which is not yet formed. Ravens are symbolic of the Black Hole in Space, which draws in all energy toward itself and releases it in new forms. The iridescent blue and green that can be seen in the glossy black feathers of the raven represents the constant change of forms and shapes that emerge from the vast blackness of the void. 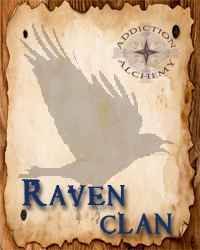 In Native American tradition, Raven is the guardian of both ceremonial magic and healing circles. Raven's element is air, and she is a messenger spirit, which Native American shamans use to project their magic over great distances. Come with me into the void of all creation, into the blackness of the night and I will show you the deep magic that is yours to bring back to your earthwalk from the Great Mystery. I can show you the velocity of your own creative force and it is mighty, do not doubt that. Those who are afraid of my power are afraid of their own. Those who embrace me and understand me have the gift of vision, wisdom, and a deep understanding of all relations. You can read the hearts and souls of others, often like a book. If you will follow me into the darkness and face your own shadow, you can bring this gift back with you into the light. And your ability to read the intentions and the thoughts of others will intensify and purify as you clarify your intentions. Your high intelligence, your cunning and your skill and ability to craft and create is your greatest gift. Yet it is also your biggest weakness, for you do know a great deal, but you do not know it all. If you think you do, I will bring you before the onyx looking glass and ask you to look deep into it's dark, watery surface and all will be revealed. This I do to hone the shaman within you, the magi that is burgeoning to become known, not only to you, but to the world. There is much as yet unmanifested in the ethers awaiting you to give it form. To go here we must activate your imagination and you must trust me. If Raven has come into your life, you can expect that your imagination will be sparked, and you can definitely expect many changes to begin to take shape within your life. Raven is all about creation...and sometimes in order to create, we must first relinquish old habits, lifestyles and ways of being. With Raven medicine you will be courageously led into the recesses of your inner self and be given not only the knowledge of what needs be done, but the wisdom and wherewithal to make those necessary changes. And although at times these journeys may be scary to undertake, they can be the most healing. Change is part of the natural Wheel of Life, and this is all part of Raven's reputation of being an omen that foretells of death. He or she is there to help you foretell and render what must be destroyed in order to birth something new. This is an important element of the mysticism of Raven's own magick. You are a shape-shifter. You can be at two places at one time. You may have 2 or even 3 different careers at once, but your passions lie in the act of creation. Your creativity is bound to your sexual force. So when you restrain one, you restrain the other. When you leak one, you waste the other. I can help you harness or set free your sexual energy whatever the case may be, for when you block or leak these energies this erodes your ability to create with true purpose and passion. Everything that comes into manifestation begins in the void, in the womb of creation. In the dark recesses of our dreams lay the seeds of our light and so we must not be afraid to go to the dreamtime and claim what we want. Raven says, "Get on my back and reclaim the monster creativity that lies within! Let me take you to your deep magic, the wild, grand, grounded part of you that knows exactly what to do to manifest your greatest desires with courage, confidence and just a hint of craziness!" I am a shape-shifter, easily flowing between the roles in my life. My creativity is fueled by my passion for beauty and excellence. I am a tender and confident lover. I love my body and am comfortable in my own skin. I have the courage to open my heart to true love. I give and receive love unceasingly, just as I breathe. I believe that magic and miracles manifest through me. I accept myself, exactly as I am in this moment. I give myself enough quiet time to go into the void of my imagination. I am in direct communion with my active imagination. I allow myself to be cradled in the void of creation. I receive inspiration and guidance from deep within. I allow myself to feel the energy of my creative life force. My sexuality is a beautiful, natural expression of my creative force. I am a creator of love and life. I honor all aspects of my body, mind and heart and soul. I am free to express myself creatively with passion and enthusiasm. I allow my inner flame to ignite my passion to engage fully in my life. I use my intelligence to discern and create with skill and insight. My conscious awareness is finely tuned. I have deep insight into my own soul. I have the power to influence and heal the mind. Odin had two ravens - Huginn (thought) and Muninn (memory) who flew about the world, delivering messages, gathering knowledge and reporting back to him. One of Odin's many titles is Hrafna-Gud, the God of the Ravens. Odin's daughters, the warlike Valkyres, were sometimes said to take the shape of ravens. At Oxford University in England, ornithologists conducted an unusual experiment with two New Caledonian Crows named Betty and Abel, reported in the August 9, 2002 issue of the journal Science. They placed a tiny bucket of meat inside a pipe, and left two pieces of wire in their cage, one hooked and one straight, to see if the birds would choose the hooked wire to retrieve the bucket of meat, proving that birds were "tool users" on a par with higher levels of animal intelligence. "We were delighted and extremely surprised" reported Alex Kacelnik, one of the bird experts studying the crows, when Abel stole the hooked wire from Betty, and rather than giving up, Betty "modified" the straight wire into a hooked wire, and was thus able to hook the bucket, pull it up, and retrieve her snack. This elevates ravens from "tool users" to "tool makers", which places them on a par with primates. According to neurologist Stanley Cobb, birds do not have a complex cerebral cortex, such as mammals do, but rather, they have developed their hyperstraiatum, a part of their forebrain, that can carry out complex functions. Corvids, especially Ravens, Crows, and Magpies, have the largest brain size (i.e. the largest number of brain cells) among birds, including the largest hyperstriatum.